HCM CITY (VNS)— The protection forest along the coast of Tien Giang Province's Go Cong Dong District has become seriously eroded, endangering the lives of local residents and damaging farmland. The 700ha submerged forest has helped protect dykes, farmland and houses of thousands of households along a 20-km stretch of coast in the Mekong Delta. 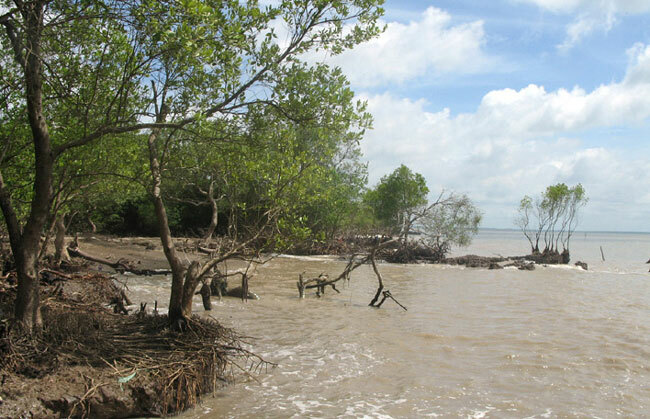 From November last year to February, many sections of the forest were seriously eroded by sea waves, according to Le Duc Phong, head of the Protection Forest and Dyke Management Bureau under the province's Sub-department of Irrigation and Storm and Flood Prevention and Control. In some areas, the width of the forest is only a few dozen metres. Nguyen Thien Phap, head of the province's Sub-department of Irrigation and Storm and Flood Prevention and Control, said the province had scheduled more inspections and handed out more penalties. In addition, it had raised awareness of local residents about the need to plant and protect forests. Concrete revetments to protect areas that were destroyed have been built, including a revetment at a 3,500-metre important dyke in Tan Dien Commune.